NHK Documentary is about the nuclear disaster which took place in Fukushima, Japan on March 11th of 2011. In some scientific circles it has been said that the Fukushima event could potentially be a slowly changing extinction level event. This documentary focuses on the impact on the people who call Japan home. The Fukushima Daiichi nuclear disaster (福島第一原子力発電所事故 ) genshiryoku hatsudensho jiko) was a series of equipment failures, nuclear meltdowns and releases of radioactive materials at the Fukushima I Nuclear Power Plant, following the Tōhoku earthquake and tsunami on 11 March 2011. It is the largest nuclear disaster since the Chernobyl disaster of 1986 and only the second disaster (along with Chernobyl) to measure Level 7 on the International Nuclear Event Scale. Also In NHK documentary are demonstrations of how families have been broken up as a result of the nuclear disaster. Some fathers have sent their families 100’s of miles away, to escape radiation, while they stay in the high radiation level areas to work. Radiation levels in some of the homes, 2 years after the nuclear meltdown, are still too high for people to come back to their homes. A number of people have already accepted that they may never be able to return to their homes. 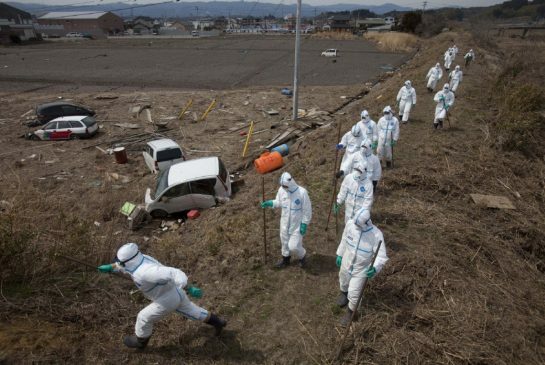 The area up to 160 miles around Fukushima, Japan could be contaminated for up to 30 years. Over 2 million Japanese people live in the radioactive area. Only 4% of the 390,000 homes in Fukushima have been decontaminated.